He says a lot of his patients this week have been feeling kind of downtrodden because of the weather, in large part because this is not quite what they expected for a Washington spring. WASHINGTON — A lot of people in the D.C. region are walking around in a sour mood — all thanks to this long stretch of dreary weather. “The rain is causing a great deal of frustration for people,” said Gregory Jones, a psychologist with the Capital Center for Psychotherapy and Wellness in D.C. The lack of sunlight compounds the problem — it can really affect some people’s moods. For those who suffer during the shorter days of winter, Jones says this might be a good time for a light-therapy box, to provide a bit of an energizing boost. He also suggests being good to yourself and indulging in some extra self-care. Bring exercise inside if you don’t want to run or cycle in the rain, because no matter where you work out, you are still pumping endorphins — the feel-good chemicals produced by the brain. Get a massage if that is a good stress reducer for you, or take in a movie you have been wanting to see. Most of all, Jones said, be sure to engage with others, and really savor that connection. “Just really focus on having some of that great energy and affection and using that to help lift your spirits,” he said. 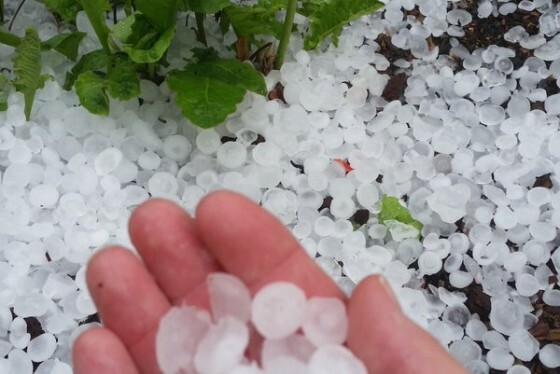 Hail pelted the D.C. area during storms Monday. See photos.